Aladin, a pedigree Haflinger and former breeding stallion, now 21 years old, was engaged in driving sports in S class when I acquired him from his previous owner, seven years ago. At that time his hoof quality was sub-optimal. Various food supplements were purchased and tried, without any visible success. After a change in stables in 2014 and a summer of constant changing weather alternating between extended dry periods and rainfall, the hoof quality became visibly worse and deteriorated even more towards the winter months. 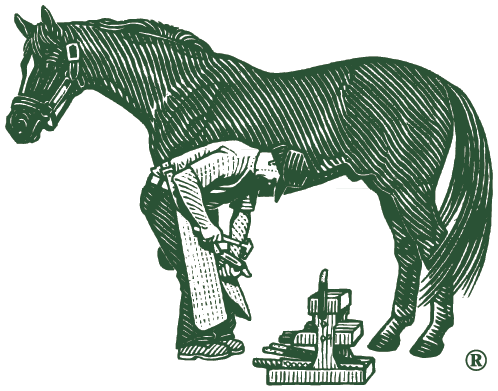 It became so bad that no shoe stayed on so that the farrier – regrettably – he saw himself forced to switch from shoeing to bare hooves. The experiment failed miserably. Aladin reacted with laminitis from overloading. Fortunately he recovered quickly after treatment at the vet clinic. When I finally found the ideal stable for us in 2015, with excellent conditions and superb feed quality, his hooves slowly became better. After an ample amount of time it was possible to apply horseshoes. The summer of 2017 again brought erratic weather conditions with extended dry periods alternating with very long phases of abundant rain showers. So, in spite of a good diet, the hoof quality started to deteriorate once again. It also became apparent that Aladin lost his feathering and the flowing coat became thinner. The hoof walls crumbled and the horn felt powdery. By chance, I met a former stable mate who had been working for a few years as a barefoot therapist. She recommended feeding Farrier’s Formula Double Concentrate and advised me to contact Life Data Labs. After sending them recent photos of Aladin’s hooves I phoned Life Data and we discussed further proceedings. I was aware of the long, rocky road laying ahead of us, considering the fact that it takes a hoof a year more or less to re-grow from top to bottom. We started feeding Farrier’s Formula Double Concentrate and a daily treatment with Farrier’s Finish. In wet weather I worked on the deeper holes with Life Data Hoof Clay twice a week. Aladin’s hoof quality has been improving significantly compared to the situation before. We also were able to detect another pleasant side effect: on time with the solstice Aladin began changing his coat. The newly grown fur is shiny and healthy looking. His feathering has also grown, as well as mane and tail. Regarding the hooves we continue to be patient, it is worth the wait.